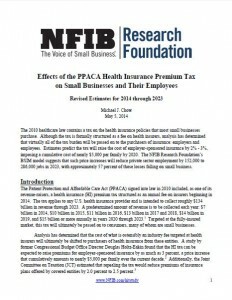 The Research Foundation’s BSIM (Business Size Impact Module) predicts the rise in cost of employer-sponsored insurance stemming from the HIT will result in a reduction in private sector employment of 152,000 to 286,000 jobs by 2023, with 57 percent of the job losses coming from small businesses. 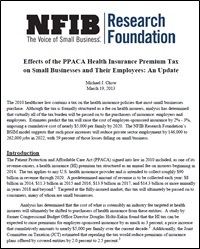 The Research Foundation’s BSIM (Business Size Impact Module) predicts the rise in cost of employer-sponsored insurance stemming from the HIT will result in a reduction in private sector employment of 146,000 to 262,000 jobs by 2022, with 59 percent of the job losses coming from small businesses. This will amount to a reduction of U.S. real output (sales) by between $19 billion to $35 billion during the same time frame. The previously released study in 2011 predicted a loss of 125,000 to 249,000 jobs and $18 to $30 billion in sales by 2021. 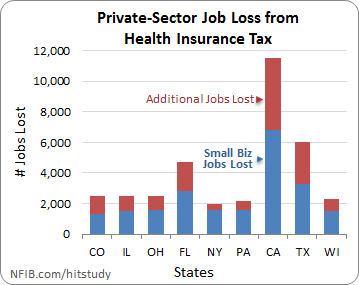 November 9, 2011 — NFIB’s Research Foundation studied the private-sector job loss that will result from the Health Insurance Tax (HIT). Relying upon independent cost estimates, the Research Foundation’s BSIM (Business Size Impact Module) highlights how the rise in cost of employer-sponsored insurance stemming from the HIT will result in a reduction in private sector employment by 125,000 to 249,000 jobs in 2021, with 59% of those losses falling on small business. The 2010 Patient Protection and Affordable Care Act contains a tax on the health insurance policies that most small businesses purchase. Formally structured as a fee on health insurers, virtually all of the Health Insurance Tax (HIT) is expected to be passed on to consumers. Targeted at the fully-insured market, the HIT will raise the cost of insurance for small businesses and their employees. 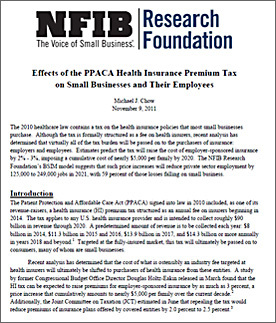 This NFIB study aims to forecast the economic consequences this tax would have on US small businesses by firm-size category. The primary input in this study is the increase in employer costs resulting from the HIT which, according to independent estimates, will raise employer-sponsored health insurance costs by 2% – 3%. The study suggest that HIT could reduce private sector employment by 125,000 – 249,000 jobs in 2021, with 59% of those job losses falling on small business.